What is the return on investment (ROI) of using the Premium Growing System? Let’s start with the importance of balancing calcium and magnesium in the soil. This concept is the cornerstone of the Premium Growing System under the Kinsey/Albrecht system used and followed by David Nelson at Pedogenesis. Calcium and magnesium are considered as elements of secondary importance by the conventional ag industry and the makers of commercial fertilizers, but the truth is that for the soil, calcium and magnesium are primary in importance both in quantity and their bio-chemical importance. All minerals must go through calcium to get to the plant. Nothing can live without calcium and magnesium, including the human body. Excesses or deficiencies of both nutrients affect whether the plants absorbs many other nutrients it needs to produce maximum yields. Excess calcium ties up important trace minerals, which are essential in the balance scheme for high yields on all crops. Too little calcium causes magnesium levels to rise, which are poisonous to all crops in excess, especially legumes like alfalfa and soybeans. Both minerals are tied to the Total Exchange Carrying Capacity (TEC) of your soils, which is determined by how much clay you have, the type of clay you have, and the organic matter in your soil. For example your soil tests indicate that your soil’s TEC ideal calcium/magnesium balance would be 68% calcium and 12% magnesium. If magnesium is higher than 20% the cost of error on corn is at least 15 bu. of corn per acre. If the magnesium level is under 10% the error is 10 to 30 bu. per acre loss in corn. These errors affect your ROI in a big way! Most of our soils in Western Minnesota and the Dakotas are low in calcium and high in magnesium, with levels of magnesium at 30-40% plus on some ground. 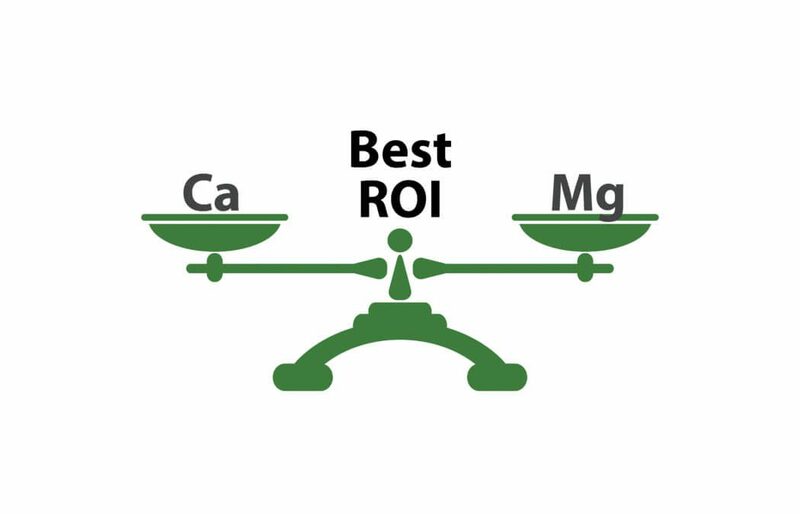 Imagine getting the magnesium in balance with calcium and the yield of corn, soybeans and wheat would be maximized and your ROI goes up! The amount of nitrogen to produce one bu. of corn or soybeans is affected by the level of calcium/magnesium in your soil. With magnesium soils above 20%, it will take 1.5 lbs. of nitrogen to produce one bu. of corn. With ideal magnesium at 10% to 15%, nitrogen requirement is only 1 lb of N to produce one bu. of corn. That is a .5 lb. additional N to produce that 1 bu. of corn. That works out to be an additional 100 lbs. of nitrogen on a 200 bu. corn crop. What is the cost of Nitrogen these days? That’s a hit to your ROI. This gets even worse in legumes. To achieve maximum legume production magnesium needs to be under 12% but greater than 10%. Balance! With the Premium Growing System the need for balance of all minerals, not just calcium/magnesium, is vital to maximizing yield of all crops, which gives you more bu. or lbs. to sell, maximizing your ROI. What are your biggest frustrations with ROI? Comment below. Can I make my pastures better? The word Pedogenesis is the combination of pedo-, meaning soil or earth, and genesis, meaning origin or birth. It is the process of soil formation or evolution by soil forming factors: climate, parent material, living organisms, topography, time, water, and man. Your soil is perpetually in the process of change. Pedogenesis can mean the difference between a high-yield, high-profit crop and a low-yield, economic disaster on your farm. At Pedogenesis Inc. we use a time-tested soil balancing system that has proven results at creating mineral-dense, nutrient-rich food and feed. Whether you are a certified organic farming, conventional farmer, or are considering a split operation you will find value in our system. Call today to get started. Designed by Eggen Group | Copyright Pedogenesis Inc.